Pitcher Jon Lester puts on a Chicago Cubs jersey and hat after being introduced as a member of the Chicago Cubs on Dec. 15. His signing was part of what was seen as the Cubs’ success in the hot stove league. For baseball fans, it can be difficult to pass the long months between the World Series and spring training. Football dominates our attention even when MLB games are actually being played, to say nothing of when the NFL is in peak season. But baseball still generates some interest when the weather turns cold, thanks to free agency, trades, and all the other offseason activity known as the “hot stove league.” The deal-making typically peaks at baseball’s winter meetings; this year’s version was held recently in San Diego. If you believe the hot stove chatter, championships are won or lost in the chess match between rival general managers and player agents. Even the betting markets seem to have bought in. The Cubs — who finished 73-89 last season and haven’t won a World Series in 106 years — saw their title odds skyrocket after emerging as one of the offseason’s biggest winners. But all of this sound and fury might signify nothing. Over the past decade and a half, there hasn’t been a particularly strong relationship between hot-stove triumphs and actual ones on the field. Further, teams don’t appear to be capable of reliably outperforming expectations in the offseason market, and the veteran players teams typically acquire tend to be paid more than their contributions warrant anyway. Add it all up, and winning the winter isn’t necessarily all it’s cracked up to be. Since the 2000-01 offseason, only about 14 percent of all wins above replacement (WAR)1 in any given MLB season have been generated by hot stove acquisitions2. That number is on the decline; last season, hot stovers created only 7.6 percent of all the WAR in baseball. That wasn’t much more than the share of all WAR (5.4 percent) generated by players making their major league debuts (a cohort not typically known for its immediate impact). How insignificant has the offseason been recently? Before the 2014 season, you could have zeroed out the WAR each team received from its hot stove pickups (relative to average), and absolutely nothing about the playoff picture would have changed, in terms of which teams qualified for the postseason. That’s because, under this exercise, the typical team would see a movement of only about plus-or-minus two wins over the entire season if there were no hot stove winners or losers at all. Big victories in the winter also track only modestly with how well a team actually plays the next season. 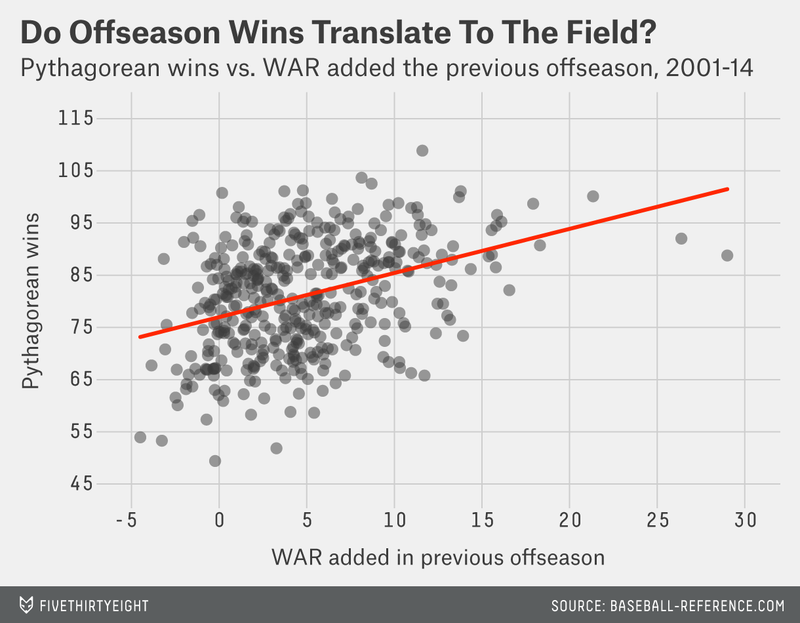 Since 2000-01, WAR generated by hot stove acquisitions explains only about 14 percent of the variation in teams’ pythagorean wins — meaning there’s some relationship, but not a particularly strong one. For instance, using that relationship and our knowledge of offseason winners and losers alone, we wouldn’t have been able to predict any MLB team to win more than 85 or fewer than 74 games last season. In reality, two-thirds of all teams’ records fell outside that range. And remember, this is all after we know how well each team’s offseason pickups performed. Predicting which offseason pickups will do well ahead of time is much more difficult — perhaps because the teams themselves can’t reliably know. There’s essentially no correlation between how much WAR a team’s haul of offseason pickups generate from year to year, and while some of that is driven by cycles of spending and austerity3, it’s also true even if we control for the amount of money teams spent. A recurring theme in sports is that the market for talent is largely efficient — and, consequently, the ability to acquire good production at below-market rates tends to be fleeting (granting some notable exceptions). It also bears noting that, because of MLB’s economic structure, the market price for hot stove players is higher than the average amount that teams generally pay per win. When we hear about the cost of a win in these contexts, it generally refers to a player’s value on the open (free agent) market, and when teams are bidding against each other, this framework does a good job of predicting what free agents will be paid for the WAR they’re expected to generate. But MLB also has an underclass of young, homegrown players who are not paid anywhere near what their value would be on the open market, and those players are the true bargains upon which championship foundations are laid. Those are also not the players who tend to change teams during hot stove season. From 2001 to 2014, teams paid about 50 percent more per WAR to hot stove leaguers than baseball paid for wins overall, if broken down using a marginal spending per marginal win model. And in each of the past two offseasons, teams paid more than double the amount per WAR to hot stove acquisitions than the overall average cost per WAR. 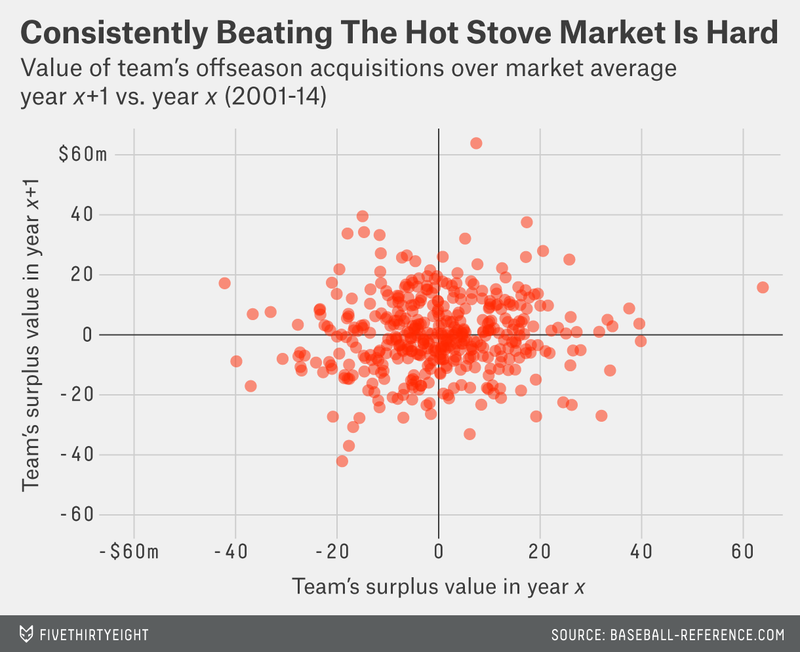 When viewed this way, teams rarely get surplus value from playing the hot stove game, even if they don’t overpay relative to the open-market price of a win. This could explain why the hubbub of the offseason amounts to very little in the standings. By devoting attention to free agents and veteran trade targets, teams chase after an expensive subset of players (what writer Matt Swartz of the Hardball Times calls “auction-market” talent) whose win production fundamentally costs more than that of cost-controlled young talent (“non-market,” in Swartz’s terminology). Front offices are finally realizing this, which is a big reason why we’re seeing more talent locked into long-term contracts at a younger age, and why, consequently, fewer meaningful stars get to peddle their wares during hot stove season. This doesn’t mean offseason player movement means nothing at all. About 30 percent of MLB-wide WAR last season was generated by a player who had been acquired by his team during hot stove season sometime in the previous five years. And, if nothing else, the hot stove rumor mill keeps baseball in the headlines over the winter. Just the same, though, we shouldn’t expect the results of those deals to match the hype that comes with them. With some exceptions, the same teams don’t tend to pour massive amounts of money into free agency year after year.